Chris Code (right) with audiobook client at Audio Ruckus. Chris Code is a December 2017 graduate from the Sound Design for Visual Media program at IPR. Since starting in January of 2016, Chris had embraced the IPR community and shown a great level of collaboration with students in other departments to work on various projects in all forms of media. 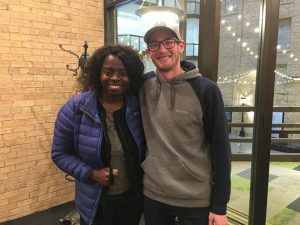 In September 2017, Chris began an internship at Audio Ruckus, a voice-over studio in Minneapolis and has continued working in the industry in various sound design and audio projects. Where are you working? What is your job there? Can you explain what each duty entails? I currently work as an Audio Engineer and Sound Designer at Audio Ruckus, a Minneapolis voice over studio. For the most part, we record voice overs for TV, radio, and web advertisements. As an engineer here, it is my job to record voice talent, mix and master for whichever platform the ad will be airing. Most of my sound design duties revolve around placing sound effects, recording Foley, and editing music for clients. Do you feel that your education in Sound Design at IPR helped you get to where you are? If so, how? I can confidently say that my education at IPR helped me get to where I am now for a couple of reasons. IPR’s instructors and faculty allowed and encouraged me to keep an open mind about my future. You have to wear multiple hats and escape the mindset of detrimental tunnel vision. Whether sound designing for film or recording and mixing voice for radio and television, I learned very important lessons. Broadening the never ending horizon of knowledge is the best thing you can do for yourself. And two, being able to learn and work with people who are currently industry professionals gave me extremely valuable insight on what it means to work in this industry, as well as how I should carry my own self as a professional in this industry. How did having an internship help prepare you for your current role? What are some things that you learned that could not be taught at IPR? I can’t stress enough that finding an internship opportunity was so important to where I find myself today. While I am lucky and grateful to say that my place of employment now is where I interned, I realize that this doesn’t happen for everyone. Nevertheless, that internship, for one, gave me a great look inside the professionalism of a recording studio. It made me realize that there are other avenues to explore other than what I had originally gone to school for. What specific things about your time at IPR did you enjoy most? IPR has amazing facilities, and while those facilities were fantastic for practicing workflow, professionalism, and fine-tuning skill sets, it was the community that made my time at IPR important and worthwhile. From the faculty to the group of like-minded, creative individuals trying to better themselves, the IPR family has put me in a place where I feel comfortable with myself and my abilities as a contributor to the industry I hope to continue working in for the rest of my life. Which classes or teachers did you find most helpful for your career? One of the first classes you are required to take is Media Industry Landscape. This class gives you a broad view of what is going on in an industry that is highly competitive and constantly changing. While not the most hands on course in the curriculum, the insight that course gave me was very eye-opening. Dik Shopteau was another big influence, and while we don’t share the same musical background, he taught me humility and open-mindedness. He also taught me the courage to be upfront and confident with my thoughts and ideas. Before his departure as Sound Design Chair, Jeff DesLauriers told me to have an open mind about moving away from home (the Twin Cities) as job opportunities are everywhere. His passion for sound design definitely rubbed off on me. Mitch Hare was always a supporter of mine, and is now a good friend of mine. His knowledge of the music business is like, as well as the patience it takes to start a business will always sit in my mind for future reference. Sound Design is my passion, and Luke Harper stepped in to fuel that passion. While he was my instructor for many terms, he treated his students and myself as if we were his coworkers. One of the reasons I chose to go to IPR was the aspect of hands on learning. In Luke’s sound design classes, you don’t feel like a student, you feel like you are a part of a team. I think that was really important for me to feel; the idea that one’s creativity counts just as much as the other. HUMILITY. If you ever have any technical questions, you can find Zac Bates in Master Mix B. He is one of the most tech savvy audiophiles I’ve ever met – and he’s just genuinely a good person. His classes were always just a lot of “let’s pick Zac’s brain, and never stop asking questions” – of course while following the curriculum. What is the best advice that you have received from an instructor at IPR? What was it? Scooter Nelson must’ve been a huge fan of the hit Jim Carrey comedy “Yes Man.” “Always say yes; be a ‘yes’ man.” Get the job, ask questions and get help after. Especially when you are first starting out as a freelancer; there is no luxury of the word no. I think that is also a healthy rule to live by not just within your career – in most situations. What do you think it means to be successful in this industry? What advice would you offer to students who are either just getting ready to graduate or who are wondering how to find their place in this industry? For me, I think at the moment, success is a direct result of feeling proud of the things you have accomplished or may be accomplishing at that moment in time. While starting out in this industry, finding work can be painstaking; it can be depressing; it can really make you second guess the goals you have made for yourself. But taking each little win, and allowing yourself to build one step at a time will do so much for your psyche. In turn, I think, this gives you a grasp on what it means to be successful. I will say that as a working professional in this industry, do not measure your success based on fame or big name things that you’ve done; while those things are good, stay humble. A lack of humility sends your creative path into a drought, and understanding the difference between confidence and big-ego is something that will take you further in your career. What advice would you offer to students who are either just getting ready to graduate or who are wondering how to be successful in this industry? For those who are getting ready to graduate, keep an open mind. Understand that things in this industry are never set in stone and while one opportunity may flounder, another may arise out of the blue. Make connections, make friends, be yourself, and I guarantee you progress will come. Don’t be afraid to do things you haven’t done before because those friends and connections you have made, not only at IPR, but within the community itself, will always be able to guide you through the process if you ask.